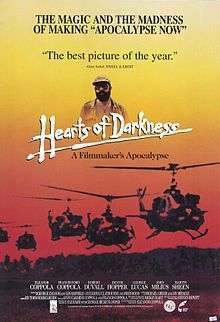 Not to be confused with Heart of Darkness (1993), a film version of the original novel that Apocalypse Now is based on. Hearts of Darkness: A Filmmaker's Apocalypse is a 1991 documentary film about the production of the 1979 epic Vietnam War feature film Apocalypse Now. The original movie which the documentary was about had been directed by Francis Ford Coppola and starred Marlon Brando, Martin Sheen, and Robert Duvall. The title is derived from the source material for Apocalypse Now, the Joseph Conrad novella Heart of Darkness. Using behind-the-scenes footage, and narrated by Eleanor Coppola, it chronicles how production problems including bad weather, actors' health and other issues delayed the film, increasing costs and nearly destroying the life and career of Francis Ford Coppola. In 1990, Eleanor Coppola turned her material over to two young filmmakers, George Hickenlooper and Fax Bahr (co-creator of MADtv), who then shot new interviews with the original cast and crew and intercut them with her existing material. After a year of editing, Hickenlooper, Bahr, and Coppola debuted their film at the 1991 Cannes Film Festival to universal critical acclaim. Originally aired on television in the United States, Hearts of Darkness won several awards: The National Board of Review, USA award for "Best Documentary", 1991, an American Cinema Editors award for "Best Edited Documentary", 1992, two Academy of Television Arts and Sciences awards for "Outstanding Individual Achievement – Informational Programming – Directing" and "Outstanding Individual Achievement – Informational Programming – Picture Editing", 1992, and the International Documentary Association award, 1992. Hearts of Darkness was released on DVD November 20, 2007. The DVD version includes a commentary track from both Eleanor and Francis Coppola (although each was recorded separately) and a bonus documentary entitled Coda, about Coppola's film Youth Without Youth. A sample from the Coppola interview shown at the beginning of the film, "We were in the jungle, there were too many of us, we had access to too much money, too much equipment, and little by little we went insane", is featured in UNKLE's song ""UNKLE (Main Title Theme)", and also in the Cabaret Voltaire song "Project80" (as part of a larger sample from that interview). Hearts of Dartmouth: Life of a Trailer Park Girl is a documentary about the making of the TV series Trailer Park Boys. It was directed and narrated by Annemarie Cassidy, then-wife of Trailer Park Boys director Mike Clattenburg. An Animaniacs cartoon entitled "Hearts of Twilight" was a parody of the documentary. The television series Community paid homage to the documentary in the season 3 episode "Documentary Filmmaking: Redux", with Abed and guest star Luis Guzmán both recognizing the homage and stating that "Hearts of Darkness is way better than Apocalypse Now." On the DVD commentary of Good Will Hunting, Matt Damon and Ben Affleck reveal that Casey Affleck's line "I swallowed a bug" is a reference to Marlon Brando. Similarly, in the Joss Whedon film Serenity, River Tam has the same line. The 2008 comedy film Tropic Thunder starring Ben Stiller, Jack Black, and Robert Downey, Jr. was meant to be a parody of both Hearts of Darkness and Apocalypse Now. Burden of Dreams, about the making of Fitzcarraldo. Empire of Dreams, about the complicated production of Star Wars. Jodorowsky's Dune, about the troubled pre-production and unsuccessful adaption of Frank Herbert's novel Dune. Lost Soul, about the making of the 1996 version of The Island of Dr. Moreau. Lost in La Mancha, about Terry Gilliam's unfinished film The Man Who Killed Don Quixote, a film adaptation of the novel Don Quixote by Miguel de Cervantes. ↑ "Festival de Cannes: Hearts of Darkness: A Filmmaker's Apocalypse". festival-cannes.com. Retrieved 2009-08-10. ↑ "Home Cinema @ The Digital Fix - Hearts of Darkness: A Filmmaker's Apocalypse (R1) in November". Dvdtimes.co.uk. Retrieved 2011-07-08.